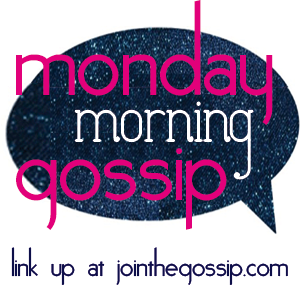 Linking up with Leeann for Monday Morning Gossip. 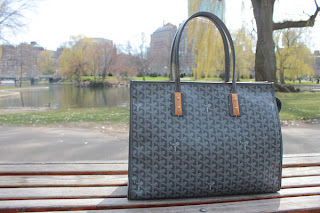 Today, I'm gossiping about my new Goyard Marquises Tote. 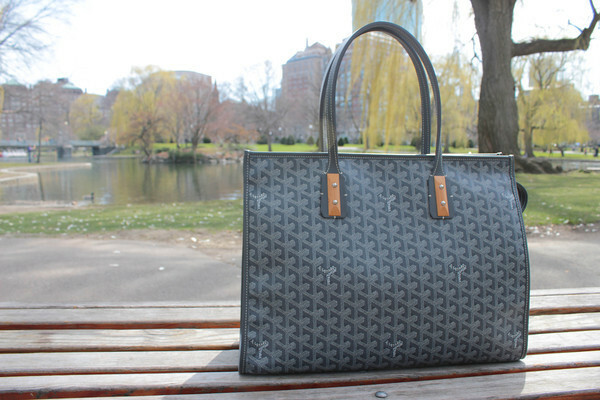 I'm totally loving my Goyard Marquises Tote. I have had it for a few months but haven't used it. I'm weird like that. I buy something, put it in my closet and just look at it. When Bmoney asked me if I wanted to do a photo shoot with one of my bags, I knew I had to take this beauty out. It was her first time out!! Ha! She was a little disappointed that the flowers weren't really out yet. This bag is roomy enough for my daily junk but still looks polished. I cannot stand when my bag looks overstuffed. This bag fits it all and then some. Can we talk about the color for a moment? It's a gorgeous grey!! Love love the color, it's really want drew me to the bag in the first place. A HUGE thank you to Bmoney for taking such awesome pictures. If you are in the Boston area and are looking for a photographer, check out Bmoney!! Her eye for detail is fantastic, she is also super fun and super sweet. Check out her website, here. Much thanks to Leeann for letting me link up. Check out her blog, Join The Gossip. What bag are you carrying today?? drooooooooool you're so lucky you live in boston and have access to goyard.. i didn't appreciate it when i lived in san francisco even though they have a goyard flagship store there.. and never went inside *gasp* i know i know but now i'm really loving goyard it's so chic, timeless and i LOVE that not EVERYONE and their mama has one!! yours is sooo gorgeous! love it!! Haha I love it! It's almost like the traveling gnome, but prettier! LOVE this tote! It's so versatile! Happy Monday! Cute tote... and very pretty pictures!